Just a few years ago, the New England Patriots cornerback JC Jackson lit up stat sheets for Immokalee High School. Now, Jackson is heading to Atlanta for Super Bowl LIII. Rodelin Anthony, his former high school football coach, said it puts their community and the football program on the map. “Tell them, ‘hey keep fighting because I was once using that same exact locker as you. Now look where I am,'” Rodelin said. “I think the sky is the limit. I think you set your goals. I think he exemplifies that. 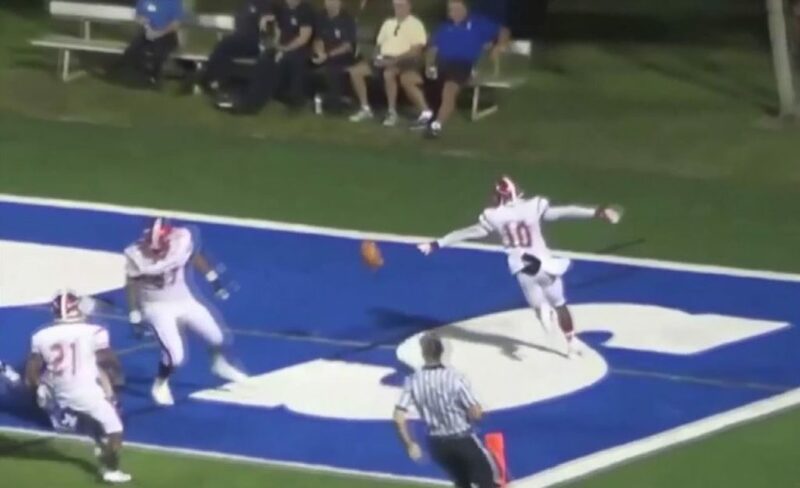 JC Jackson returns an interception for a touchdown while playing for Immokalee High School. Photo via PrepForce.com. Jackson once was a promising player at the University of Florida. But after some trouble with the law, he found himself signing as an undrafted free agent with the Patriots. Now, Jackson is one step away from being a champion. Edward Barnes went to high school with Jackson’s dad. He said the two are remarkably similar. As for Anthony, he remains humble as one of his boys lights up on the world’s biggest stage. He hopes Jackson’s success will help his current players gain exposure from good college football programs. Jackson will have a tough task in taking on one of the NFL’s best passing offense — the Los Angeles Rams — in two weeks.